Martyn, We are all delighted with the window – it has transformed the view from inside and you made the frame more delicate and stylish. A very professional job and we are most grateful to you for your skill and expertise. Hi Martyn, Many thanks for supplying and fitting the barn door. We both really like the quality and finish of both the door and frame. It’s a great addition to the barn. Martyn, thanks for the splendid door, top job! Hi Martyn, Thanks for a great job on the floor. Dear Martyn, Patricia and I thank you very much for the work you’ve carried out. Anyone who has seen the radiator cover and mirror have been full of praise. Thank you once again for the attention to detail, the work done by you was to a very high standard. Wonderful door – thank you! Martyn did a great job in restoring my solid oak bureau. This is an important piece of furniture to me, so I was keen to know that it was in good hands. He was helpful and knowledgeable from the start and his passion for working with wood is evident. I have no hesitation in recommending Martyn for the quality of his work, his expert advice and attention to detail. Thanks Martyn, the doors are terrific! Thanks for a lovely gate, Martyn. We’re very pleased with it and our neighbour thinks it’s super. Very best wishes. We are very pleased with the windows – thank you for all your hard work. The craftmanship is superb. Dear Martyn, May I thank you, yet again, for completion of what became a mammoth task for you during the last year. You made what could have become a very disruptive process, much less painful and even pleasant at times. We are thrilled with the quality and craftsmanship of the final outcome and I am positive it won’t be too long before we call on your services yet again! Dear Martyn, please find the enclosed cheque for our wonderful door. We are really pleased with it. The windows are fantastic, thank you! Martyn – great job as always. Martyn, what a fabulous job! We came back today to a really wonderful wardrobe. We love it, it looks great – like something out of a five star hotel. Its a fabulous design, far better than we expected. Its changed our lives, or at least a bit of it. Thank you so much for getting it done before Christmas and so painlessly on our part. Thanks again. Hi Martyn, Thanks for all your work on the staircase. It is looking lovely and we are very pleased with it. Hi Martyn, Fabulous job at Jill Turtons. The whole stair has come together with your work. Many Thanks. Dear Martyn, we are both delighted with the floors and the work you did. Many Thanks. Hi Martyn, thank you so much for our lovely kitchen. Hi Martyn, Very many thanks for the fabulous cabinet and computer desk – they are both brilliant. Martyn has done a number of jobs for me, including wardrobes, cabinets and wood flooring. I have been consistently impressed with Martyn’s work both his friendly approach and advice on style, design and explanation of different types of wood for the piece I was asking about. I am very impressed with the high standard of workmanship and his clean and tidy work when he was working in my home. I have been pleased to recommend him to a number of friends who have been equally satisfied and tell me they would have no hesitation in recommending him to their friends also. Dear Martyn, thanks for the excellent job you’ve done. Dear Martyn, thanks again for a brilliant job. Our bathroom is like a sacred place … we have to take our shoes off before we enter! It has been admired by all, but nobody else is allowed in to use it. Thanks again. We hope to work with you again, we will positively recommend your work. With thanks. Dear Martyn, thanks for the excellent flooring which we are both very pleased about. Thanks once again. 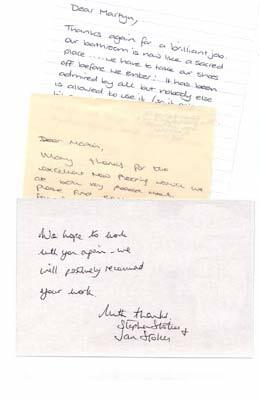 Dear Martyn, I was up at the York house last week – the floors looked lovely I was very pleased with them. Thank you for your quick and efficient work. Both Lynne and I are highly impressed by the quality of finish and the workmanship that Martyn put in. We would like to thank you for your excellent service and we wish you both and your business all the very best for the future. Delighted with the floor, again – looks great. Martyn, thanks again for an excellent job, the wardrobes are perfect! And we are very pleased with our new bedroom. To Martyn, Thank you for all your hard work this year. See you next!! Martyn, Very many thanks for all your hard work, it looks great. All the best. Dear Martyn, thank you for being so helpful in this matter and for once again doing a fantastic job.